Reliable. Affordable. Versatile. Green. It just makes sense. Let us show you why honeycomb is the perfect alternative to wood pallets and plastic pallets. Honeycomb is an exceptionally strong product created by sandwiching hexagonal-shaped kraft paper cells between sheets of kraft liner paper. The cell sizes and liner paper thickness can be adjusted as needed to create a board with the right strength to hold your product. Made from renewable resources, honeycomb is environmentally safe, biodegradable, non-toxic, and 100% recyclable. It has tremendous strength despite its light weight. These characteristics make it perfect for packaging as well as many other applications. Honeycomb boards can be custom die-cut for your product, making it possible to safely layer the product on pallets. 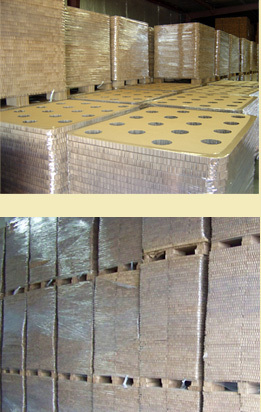 Honeycomb boards also make excellent load stabilizers, reducing product shift during transportation.